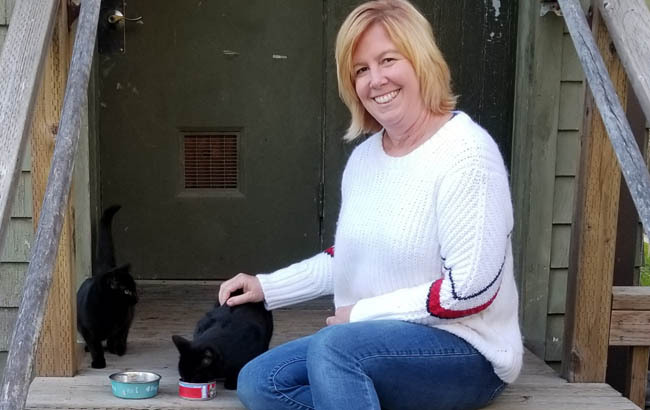 Lea Ronald, Director of Services of Napa Valley PSI – and Guardian Angel of the black cat colony that lives next door. Life in the wild is never easy, especially when you are competing for food resources and trying to stay alive amidst foxes, coyotes, hawks, and various other wild critters. 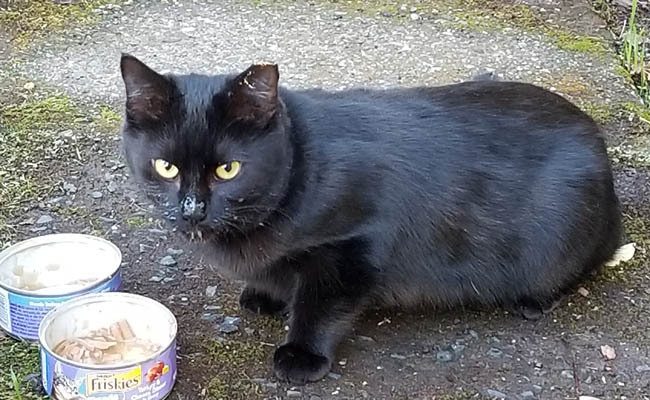 The “black cat colony” at Napa Valley PSI has been in existence for at least 3 years, under the leadership of the big gnarled tomcat named Cujo, and the patchy sway-back queen, Patches. These two typically produced in litters of three; usually only one kitten survived in the wild. It was not uncommon for us to finally get to touch one of the babies during feeding time, and then have it not show up the next morning. In the spring of 2018, I started feeding them canned food on a diligent schedule. My goal was to instill trust so that I could easily trap, spay/neuter, and release them back to their environment. As we became more adept at caring for the cats, their survival rate increased. The population could have quickly gotten out of control. But through a coordinated effort with Napa Humane, Jameson Animal Rescue Ranch and Napa County Animal Shelter, we were able to successfully control the population. Napa Humane provided loaner traps and the spay/neuter services, along with vaccination for rabies and FVRCP, flea treatment and an “ear tip” to make each individual cat easy to identify (critical for future trappings) as part of their community cat program. Napa Humane pays for almost the whole cost of these services and charges just $35/cat for the full treatment. Because we had so many cats, though, we were able to get vouchers from JAAR and the Animal Shelter to cover the rest of the cost. Thanks to these organizations’ coordination and help, we were able to spay/neuter/vaccinate all of the PSI cats at no cost to us. My trapping skills and strategy improved with each attempt. After capturing a raccoon and a fox, I learned from Napa Humane that it is important to set traps out at feeding time only. (I also learned that raccoons are very, very big and have herculean strength, and that foxes have beautiful eyes.) I discovered it is best to cover the trap with a blanket, and that a layer of newsprint on the bottom helps disguise the trip plate. When handling wild animals, including feral cats, I also learned there is one important factor we mustn’t take for granted: they are wild. My accident happened with Kitty-Bitty, a small female whose trust I had gained and who simply walked into a crate for food. She was small, young, and (we later learned) already pregnant with one baby. When I closed the door behind her, my hand slipped and she took a healthy bite of me. I, in turn, went through a series of rabies vaccines. She and I are now great friends; she runs to me for petting each morning. She also assisted me in trapping the others by lying near the set trap and demonstrating that it’s nothing to fear. Soon after her spay, we trapped Mama Patches, who showed evidence of active nursing. Then, we captured the elusive tomcat, Cujo. With Kitty-Bitty’s help, I then successfully located and trapped their latest litter: Pee-Wee, Spooky, and Indy. Spending a few minutes each day touching these kittens during feeding time made it easier to trap them, and easier for the team at Napa Humane to handle them.